A popular Instagram fitness model said to be a 'casual' friend of the Kardashian clan has been identified as the blonde who was rushed to the hospital after Kylie Jenner's birthday. Tammy Hembrow was unable to keep the party going while at the Thursday night festivities at the Delilah in West Hollywood. The bodacious Australian model was taken from the scene, face down, after paramedics arrived just before midnight, The Blast reports. Hembrow is said to be on friendly terms with the family, appearing in a Good American clothing ad with Khloe Kardashian just last year. She posted on her Instagram story on Friday, looking to have rebounded from her last night shenanigans. The Queensland mother-of-two has a fitness app called Tammy Fit where she shares tips on how to live a healthier life. She has more than 8.6million followers on Instagram. 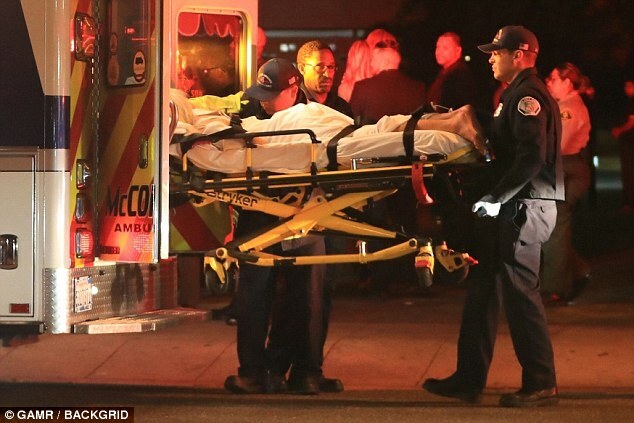 Hembrow was seen being wheeled out of West Hollywood restaurant and club Delilah strapped face down on a stretcher. 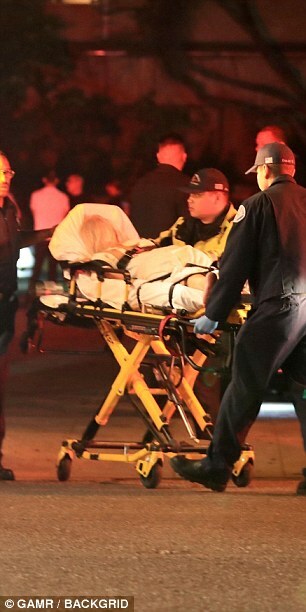 She was loaded into the back of an ambulance as Kylie's father Caitlyn Jennerand her partner Sophia Hutchinson looked on in horror. 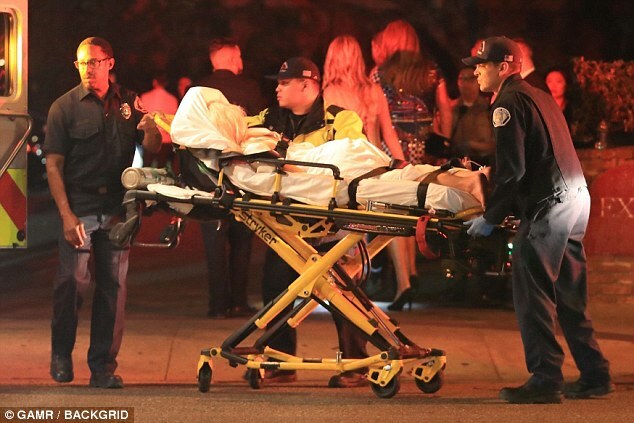 Caitlyn looked extremely concerned in photos taken of the carnage on Thursday night, as Hutchinson spoke with security. The party featured the entire Kardashian-Jenner clan going all out to celebrate the mega-rich reality TV star's coming of age. Kylie splashed cash on a large ball pit, personalized party favors, a photo booth and even a family mural dedicated to the famous family and their friends. Kylie had Delilah's outside walls covered in pink tinsel, while the ceilings were bedecked with glistening pink balls which later released pink confetti that showered down on dancing guests. When partygoers weren't busting moves on the dance floor, they were able to lark around in a gigantic ball pit filled with pink balls and elaborate love heart balloons. Kim and Khloe Kardashian shared clips of themselves jumping around in the pit, which was surrounded by mirrors to ensure the glamorous guests were able to fix themselves up after messing around in the pen. She also paid homage to her famous family by covering an entire bar wall with a mural dedicated to the tribe and their boyfriends, as well as her sisters' late father Robert Kardashian. 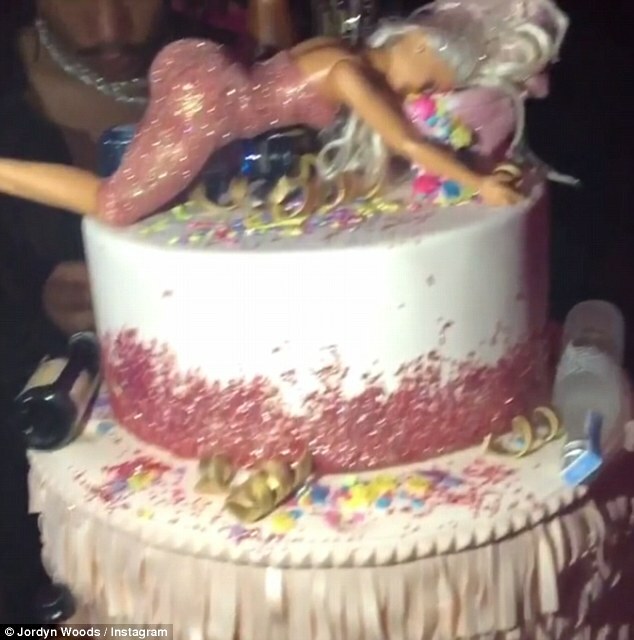 VIP guests including Nicki Minaj, Winnie Harlow, and Dave Chapelle all turned up to party with the birthday girl. The mother-of-one and beauty mogul looked incredible as she debuted her platinum blonde locks while wearing a magenta dress which had a cut-out detail on the waist. Shoulder pads added a retro vibe to her look, while the asymmetrical hem showed off her perfectly sculpted legs. Delicate magenta ballet-inspired stilettos added a few inches to her 5ft6in frame. Her blonde tresses were parted on the left and surgically combed back and down into a long ponytail.